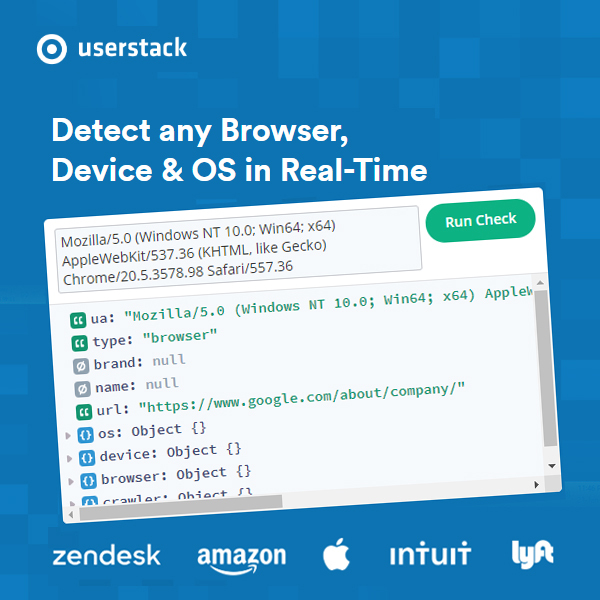 Userstack is a powerful application programming interface, designed for detection of the device, browser as well as the operating system being used by the website visitors for interpretation of the User-Agent string. Used by reputable companies including Apple throughout the world, API is something that serves to enhance the user experience by many folds. Userstack has been designed by Apilayer which is a software company with bases in various countries including London and Austria. The company has introduced a variety of API products, and each has managed to exceed expectations. What works in favor of Userstack? There are quite a few factors that work in favor of this product and make it worthy of consideration. You will find this product to be highly scalable and flexible. They have a rather scalable cloud infrastructure which provides you with impressive coverage at every step along the way. Whether it is a small number of API requests or a multitude of requests received in a single day, you can be sure that Userstack will not let you down. Accuracy is not something that you will have to worry about when it comes to this product. The user-agent database is closely monitored and updated on a regular base thereby ensuring that you get reliable results with minimal margin for errors. You will not have to face any problems in using this API. You will find it to be rather simple in terms of design, thereby ensuring that you do not have to spend a great deal of time in acquiring an understanding of it. You will be able to get started with your work within a short duration. Budget is among the leading problems that people seem to have when it comes to using such programs. Userstack endeavors to make things easier for you. You can make around 10.000 requests free of cost, and if you wish to continue with the association, you can use one of the various plans that they offer, all of which are quite reasonably rated. Make sure that you opt for the plan which suits your requirement. It all comes down to performance, and this is one area where you will not find Userstack lacking. It is capable of providing you with all the features that you need and more. Userstack manages to give you a lot of ease and impressive performance along with ample convenience. For instance, you have the option of deciding whether you want to pay yearly or monthly for the services. You are also given a chance to interchange between the two options. This is just one example of how Userstack values your feasibility.